Here’s a great video of Rick Sanchez on CNN showing video evidence of Fox News’ lie in their newspaper advertisement that claims that other networks did not cover the 9/12 protest. 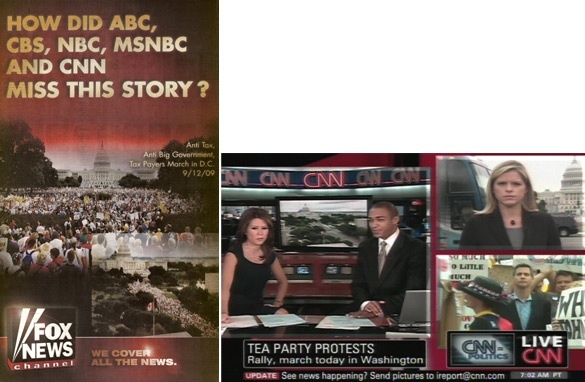 There are several clips of CNN reporters at the event, discussing the event, and showing an angle from their tower camera that is nearly identical to the picture used in the advertisement. Perhaps the best part is when he shows Bill O’Reilly stating that CNN covered the event. Ooops. It’s always great to see someone in the main stream media call Bill O’Reilly out on his lies, especially when it’s an absurd lie and there is absolute irrefutable proof. Take Bill O’Reilly’s comments about CNN not covering the Army recruiting center attack until Anderson Cooper featured it. O’Reilly had the audacity to state that CNN didn’t think of the tragedy as news and failed to report on it all day. Rick Sanchez proceeded to play a montage showing CNN anchors and reporters discussing the incident all day. “Let’s see, that was Kyra Phillips, Tony Harris, Heidi Collins, Lou Dobbs, certainly you saw myself, you just saw David Mattingly there, Wolf Blitzer, we saw Kiran Chetry, we saw Erica Hill — that’s nobody?” Sanchez asked.